Our Policy is to build a first grade construction process product by assigning the utmost importance to Quality in order to achieve high levels of Client satisfaction. The policy further stipulates that no task or service is so urgent that Quality requirements should be compromised. CSCEC is committed to comply with our customers’ quality requirements inclusive of applicable legislation and regulations. We are committed to provide continuous efforts to identify and eliminate or manage defects associated with its construction activities through continual improvement of Integrated Management System. Deploy adequate & suitable resources for the job. Achieve targeted milestones within the specified time period. We shall ensure that the Quality Policy is communicated and understood within the organization, and made available to all interested parties. The Quality Policy and respective Key Performance Indicators (KPI) for each functional department shall be annually reviewed for its continuing suitability and appropriateness, and accordingly revised if required. Preventing pollution, reducing waste and ensuring, wherever practicable, that measures are implemented to protect and preserve the environment. Considering the effects that our operations many have on the local community. Taking action to eliminate or reduce, as far as practicable, any potentially adverse environmental impacts. Managerial and supervisory staffs have individual responsibilities for the implementation of this policy and must ensure that environmental issues are given adequate consideration in the planning and day-to-day supervision of all work. 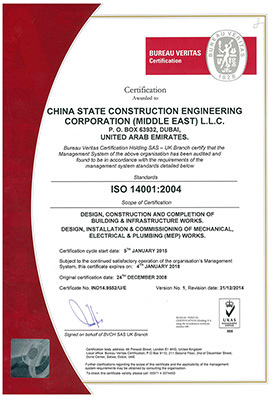 CSCEC will fully comply with the duties placed upon it within the requirements of all applicable UAE legislation whilst at all times complying with, as a matter of best practice, the requirements and duties set out within Approved Guidance as issued by regulatory authorities and other organizations. As part of the company’s commitment to maintaining the highest levels of environmental management, it is the intention that the company will operate systems and procedures in line with the requirements of ISO 14001:2015. All employees, sub-contractors and suppliers are expected to co-operate and assist in the implementation of this policy, whilst ensuring that their own works, so far as is reasonably practicable, are carried out without risk to themselves, others or the environment. This includes co-operating with management on any environment related matter. CSCEC will take all practical steps to ensure that potential hazards and risks to the environment are identified and that suitable and effective preventive control measures are implemented. All employees will be provided with the necessary resources, equipment, information, instruction and training to fulfill the requirements of this policy. China State Construction Engineering Corporation Ltd recognizes its responsibilities as an employer to provide all employees with a safe and healthy place of work in accordance with the regulations of the UAE and other requirements, and to ensure that its activities do not create hazards for other people who may be affected. To this end the Company has a continuing programme for the systematic development of standards and procedures to satisfy the legislative, and moral, requirements of Health and Safety Management. Provide necessary training for all employees. Provide each employee with a copy of the Company Safety Policy. Publicise the Company Safety Policy. Monitor or Audit the performance of all activities against this Safety Policy. Regularly review the safety policy and institute appropriate improvements. Continually strive to improve the overall safety, health and performance of the Company. Ensure that safety is an integral part of the management of the Company, and Comply in all respects with current legislation. All employees, sub-contractors and subcontractors are expected to co-operate and assist in the implementation of this policy, whilst ensuring that their own works, so far as is reasonably practicable, are carried out without risk to themselves or others. This includes co-operating with management on any health and safety related matter. CSCEC will take all practical steps to ensure that potential hazards and risks to the safety and wellbeing of all persons involved in their operations are identified and that suitable and effective preventive control measures are implemented. All employees will be provided with the necessary resources, equipment, information, instruction and training to fulfil the requirements of this policy. The directors have overall responsibility for all health and safety matters. The operation of this policy and the associated procedures will be monitored and reviewed on a regular basis to ensure that they remain current and applicable to the company’s activities.